One of the most impressive and memorable performances on Sectional Saturday had nothing to do with time or place. It had everything to do with guts and heart. In one of the most courageous and valiant finishes you'll ever see, Middletown South's Kathleen Shay was in fifth place in the North Jersey, Sec. 2 Group 3 race at Greystone Park in Morris Plains with less than a quarter mile to go when she started to struggle. Shay, a senior, began to slow down considerably and started shuffling her feet as runners sped past her. Then with about 25 meters left in the race, Shay's legs simply couldn't hold her up any longer and she crashed to the ground. After multiple failed attempts to get back on her feet, Shay did the only thing she could to get to finish line. She crawled. Many spectators in the big crowd that lined the homestretch gasped as Shay dragged her body across the gravel trail, some calling out to meet officials to help her. Knowing Shay would be disqualified if they aided her before she crossed the line, meet officials stayed alongside Shay to making sure she remained as safe as possible while runners dashed around her. After Shay finally willed herself across the line, she was scooped up by her father, Padraic, who carried her over to the EMT tent to receive medical attention. Middletown South girls coach Bill Clifton said something similar happened to Shay at the Shore Conference Championships last week, and that Shay was cleared by doctors to race at the sectional meet. Why did Shay keep going? 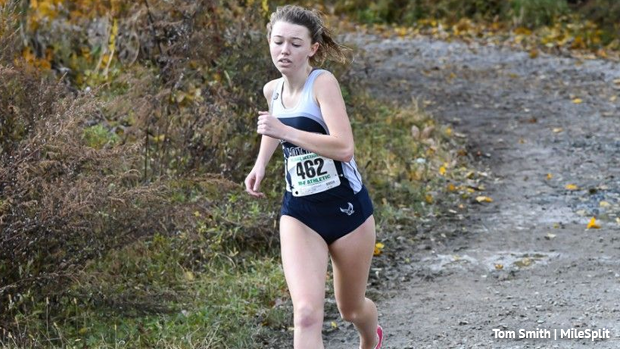 For the record, Shay finished 28th in the Saturday's Sectional Championships and Middletown South placed second to Mendham to advance to the State Group 3 Championships next Saturday at Holmdel Park. While most people will forget Shay's time and place, no one will ever forget her heart, guts and commitment to her team. Kathleen Shay is what cross-country is all about!